4 Friends. 1 Wide World of Sports. Enough Ballz to Admit, "We Know More!" END OF AN ERA IN INDY…..
Aside from myself and Jesse Palmer, doesn’t anyone remember last season? Tuesday morning, news broke that ex-football player Maurice Clarett signed a 1-year contract with the UFL. 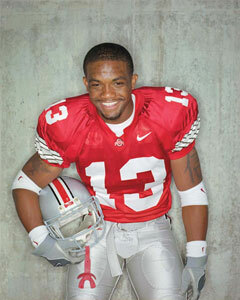 Being an alumni and fan of Ohio State it’s easy for me to display my distaste of ex-buckeye player Maurice Clarett. The guy went from being a star football player at Ohio State–helping them win a national title (2002)–to the bottom of the gutter–serving 3 and half years in prison for holding up two people with a gun outside of a bar in Columbus, Ohio, in 2006. A part of me is also proud of the guy for turning it around and getting an opportunity to play professional football, even though it’s not the NFL. I’m happy for him turning his life around and trying to do something positive now after such a negative past. As a senior at Warren G. Harding High School (Warren, OH) Clarett was one of the nation’s top running back recruits in 2002. He had the choice of many top colleges to attend but chose to stay home in Ohio and attend Ohio State. He enrolled early in the spring and worked his way up the depth chart, beating out then-starting running back Lydell Ross. He showed flashes of greatness during his freshmen year especially early in the season with great performances in games against Kent State, Texas Tech, Washington State, and Cincinnati. Then all of a sudden the real Maurice Clarett began to show his true self. He had temper tantrums on the sidelines: yelling at his position coach during a game at Northwestern as well as getting in the face of Jim Tressel. Even after the 2002 season ended, he was still bringing negative press upon himself. In 2003, the NCAA found him guilty of receiving improper benefits which he also lied about. As a result, he was suspended for the entire 2003 season. He later lost a court case challenging the NFL’s rule requiring a player to be out of high school three years before becoming eligible for the draft. 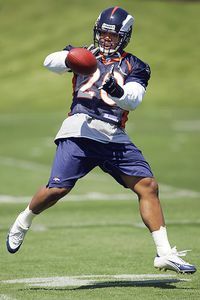 The Denver Broncos drafted Clarett in the third round in 2005, but he was hindered by a groin problem, never played in a preseason game and was cut before the regular season. At one point in training camp he showed up heavily intoxicated, after drinking a bottle of Grey Goose. He showed up overweight and not ready to perform. His downward spiral continued with the robbery, which landed him in prison and then, for the last 4½ months, in a community-based lockdown dormitory. On the early morning hours of August 9, 2006, he was involved in a high speed chase after making an illegal U-turn. He was eventually detained and found with numerous items. Officers discovered a katana, an AK-47, 2 loaded handguns and a bottle of Grey Goose. Officers tried to taser Clarett but failed because he was wearing Kevlar body armor. Eventually he was sent to prison to serve some serious time. While in prison Clarett began to turn his life around and began to write a blog. The blog was called, “The Mind of Maurice Clarett,” which was about his life in prison. He didn’t have access to the internet but sent daily entries to his family on the outside to be put on the blog. He eventually began to get noticed for how much he was trying to change his life and was given the opportunity to come back to football after years of absence. Omaha Nighthawks owner Zach Nelson and GM Rick Mueller decided to take a chance on Clarett and give him another shot at playing professional football…in the newly formed United Football League. Granted this isn’t THE League but it’s another shot to earn a paycheck in a professional league. In the full body of work, Maurice Clarett has been up and down in recent years. Going from a young college football sensation to an ex con, he’s come full circle and it’s great to see this. We are a country that favors second chances, especially when that person makes an effort to better themselves. I, for one, being a buckeye fan am excited to see Clarett get back on his feet and have another opportunity. I just hope he has the will power to stay the course and continue to be clean. The last thing he needs is to relapse and go back to his old ways.